Maintenance - Harman Landscaping, Inc.
Harman Landscaping, Inc., specializes in the southern grasses common to the southeastern North Carolina area. We offer regular maintenance to fit your needs on a weekly or bi-weekly basis. We use top of the line products to ensure a quality landscape. We are NC pesticide certified. We can help your turf look beautiful by aerating your soil, to help reduce compaction and allow oxygen and water to get to the roots. Bermudagrasses range from coarse to fine in texture, and they grow low and dense. They are very drought tolerant, require full sunlight, and grow well on all but poorly drained soils. Bermudagrasses withstand wear and traffic, establish quickly, and recover rapidly from injury. They can invade flower beds and other areas where they are not wanted because they have a strong above- and below- ground stem system. Herbicides such as Vantage, Fusilade, or Roundup are effective, although straight edging with these materials is difficult. Most fine-textured turf bermudagrasses must be planted vegetatively using sod, sprigs, or plugs, but common bermudagrasses can be planted from seed. Bermudagrass performs best when mowed at ¾ to 1 inch with reel mower; however, good performance can be achieved using a rotary mower with sharp blades set as low as possible without scalping. Uneven terrain may prohibit bermudagrass from being mowed as short as desired. Common bermudagrass (wiregrass), compared to hybrid bermudagrass (Tifway and Tifgreen), can be seeded and maintained at a higher mowing height. Common bermudagrass produces a more open lawn (more weed prone), has a wider leaf, is less cold tolerant, and exhibits more seedhead but requires less maintenance, Tifway (T-419) Tifway II are the best all-purpose hybrids for use in lawns, but they may require more frequent mowing and more fertilization than common bermudagrass. Both grasses are finer in leaf texture, are denser, and exhibit fewer seedheads than common bermudagrass, and they are pollen free. Midiron and Vamont are very aggressive, course-leafed, cold-tolerant cultivars that must be vegetatively planted. Tifgreen (T-328), Tifgreen II, and Tifdwarf require very intensive management and are not usually recommended for residential use. Guymon is a new, seeded, very course, cold-tolerant cultivar, similar to common bermudagrass in appearance. Little published information is available on the newest cultivar, Sahara. Because of their aggressive nature, bermudagrasses have very few serious pest problems, but are subject to sting-nematode damage when grown in sandy soils. Nematode damage leads to shallow-rooted plants that do not respond to water and fertilizer, resulting in thin, weak areas invaded by weeds. If nematodes are suspected, submit a soil sample for analysis. (See Extension Service publication Diseases of Warm-Season Grasses, AG-360, for information on nematodes and diseases such as brown patch and spring dead spot, and Ornamental and Turf Insect Note No. 70, Insect Management in Turf for Insects that Feed on Bermudagrass.) Contact your county Extension Center for assistance. Centipedegrass is a slow-growing, apple-green, coarse-leafed turfgrass that is adapted for use as a low maintenance, general purpose turf. It requires little fertilizer (l/2 pound of nitrogen per 1,000 sq. ft. per year), infrequent mowing, and grows well in full sun to moderate shade. It does not tolerate traffic, compaction, high-phosphorus soils, high pH, low-potassium soils, excessive thatch, drought, or heavy shade. Centipedegrass is susceptible to a number of pest-related problems. Symptoms include small circular dead areas after several years of good performance. Areas do not green up in the spring or begin to die in late spring or during drought stress. Grass at the edge of affected areas may yellow, wilt, and die. Possible causes include nematodes, ground pearls (an insect), and fairy ring (a disease). Nematode damage appears as weak areas invaded by weeds. If nematodes are suspected, submit a soil sample for analysis. Ground pearls appear as circular dead areas with only weeds growing in the center. Fairy rings appear as circular green or dead areas that continue to enlarge for several years. Injury from certain broadleaf weed control herbicides and mismanagement can also display these symptoms. Following proper lawn management practices, as discussed in this publication, is the best means of preventing and controlling centipedegrass problems. Continual loss of centipedegrass may indicate the need to choose another grass species. Contact your county Extension Center for assistance if needed. Maintenance programs provided by professional lawn care service companies may differ from recommendations given here yet be equally effective. This fast growing grass has a medium to dark green color and very coarse leaf texture. 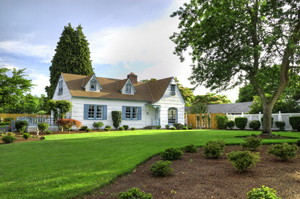 With proper maintenance, it provides a dense, lush lawn. A warm-season grass, it’s best in warm, humid areas not exposed to excessive or intense periods of cold weather. The “Raleigh” variety has the best cold tolerance and is best suited for the eastern piedmont and coastal plains. St. Augustinegrass can only be planted vegetatively. It grows best in fertile, well-drained soils. It has excellent tolerance to shade and good salt, heat, and, to a moderate extent, drought tolerance. It does not tolerate heavy traffic or cold weather. Since it is fast growing, St. Augustinegrass needs to be mowed frequently. It should never receive more than 4 pounds of nitrogen per 1,000 square feet in a year. With high fertilization rates and irrigation, thatch buildup may be a problem. Thatch can lead to other problems, such as disease and insect damage. Chinch bugs are often a problem, causing leaves to wilt and turn brown. Yellow spots are often associated with chinch bug activity. In addition, Brown (Large) Patch can create brown circular patches up to several feet in diameter that usually warrant treatment. 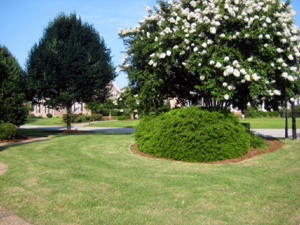 Zoysiagrasses are very low, slow growing, sod-forming grasses that make a very dense, wear-resistant lawn. Zoysiagrass grows well in full sun or partial shade. It requires less mowing but is tougher to mow and easier to keep out of flower beds than bermudagrass. It is very slow to establish when plugged (typically two to three years) and slow to recover from injury. Once zoysiagrasses is established, it can become thatchy (fluffy due to an accumulation of dead, decaying plant residue at the soil surface), especially when mowed high and infrequently or when heavily fertilized. Thatch needs to be removed every two to three years, but care should be taken because the recovery rate of zoysiagrass is slow. Zoysiagrasses perform best when mowed with reel mowers, however, good performance can be achieved using a rotary mower with sharp blades set as low as possible without scalping. Uneven terrain may prevent zoysiagrass from being mowed as short as desired. Emerald zoysiagrass has very fine leaves, good winter hardiness, shade tolerance, and wear resistance, a moderate rate of spread, and a dark green color. Meyer zoysiagrass has a medium leaf texture, is less shade tolerant, and lighter in color than Emerald. Meyer establishes more quickly than other zoysiagrasses and is the most cold tolerant. Zoysia matrella (manilagrass) is intermediate in leaf texture, density, cold tolerance, and low-temperature color retention compared to Emerald and Meyer. Little published research is available on the new cultivars, Belair, Cashmire, El-Toro, and Z-26. Zoysiagrasses are subject to diseases such as rust, brown patch, and dollar spot, and are susceptible to nematode injury. Nematode damage results in shallow-rooted plants that do not respond to water and fertilizer, resulting in open areas invaded by weeds. If nematodes are suspected, submit a soil sample for analysis to Agronomic Division, Soil, Plant, and Nematode Testing, North Carolina Department of Agriculture, Raleigh, NC 27611. (See Diseases of Warm-Season Grasses, AG-360, and Ornamentals and Turf Insect Note No. 70 for insects that feed on zoysiagrass.) Contact your county Agricultural Extension agent for assistance. No two projects are the same. We don't believe in one price fits all, because we won’t skimp on your service. We provide accurate, realistic, and reasonable estimates. To get started, call us at (910) 612-6996. Fertilizer turf grasses, apply post emergence weed control, fire ant, mole cricket and grub control, aeration, soil, conditioner applications and pruning. © 2013-2019 Harman Landscaping, Inc.